Yes you can still face criminal charges for marijuana in Colorado, though it’s far more difficult now. One of the ways you can is by providing marijuana to children, barring its medical marijuana for an approved child-patient. Many are concerned the growing industry of marijuana foods, drinks, and goodies is too alluring for children and the products too easily confused with the real, non-pot versions. A recent New York Times article suggested cases of accidentally ingested marijuana among children may be increasing, calling parents and others who spend time around kids to task. She’s right in that the gummy fruits, caramel candies, and sparkling drinks may be attractive to kids. But she is wrong that they aren’t being regulated. Tight regulations exist to make these products as plain-Jane as possible. The wrappers, unlike the crap you find on a grocery-store shelf, cannot have cartoon characters or other marketing tools designed to hypnotize children. 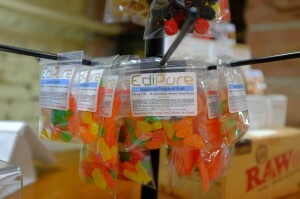 Marijuana edibles have to be packaged in pretty dull ways—plain foil, clear plastic, nothing fancy. The responsibility for keeping children away from these treats has to rest with the parents and other citizens. And most responsible marijuana users know this. We aren’t talking about alcohol here, where an “accidental” ingestion could kill a child. In the reported cases of accidental marijuana ingestion, the kids got sleepy. The risks, according to the NYT, are pretty limited and include potentially falling or falling asleep in a position that makes it hard to breathe. Alcohol, which comes in many fruit flavors, bright colors, and in the case of craft beers, in many interesting and fun-looking packages, can kill a child. But alcohol is sold in grocery stores, served in restaurants, and advertised everywhere. You can face marijuana charges if a child gets into your stash. Like alcohol, it’s your responsibility to keep it out of their reach. But the idea that kids are going to be trading gummy-ganja-fruits on the school bus is nothing but alarmist media hype and just another way for marijuana opponents to try and undo the progress being made. Yay, it’s up to “other citizens” to keep it away from kids–so we’ll ban it in our town.